PYLON NETWORK sends an open invitation to the energy markets by publishing its open-source blockchain code and offering access to the demo version of its platform. Last week we took one more strategic and innovative step regarding the development of the project, by publishing Pylon Network’s core code with an open-source license – the first fully operational blockchain code developed specifically for the needs of the energy sector (see more here: https://pylon-network.org/pylon-network-releases-pylon-coin-open-source-blockchain-code.html). Figure 1 Structure of the Pylon Network – Layers of information among the actors in the energy market. With this move we make an emphatic statement in accordance to our beliefs and ideology regarding the energy transition. If we are to tackle the global problem of climate change, there is no room for competition; on the contrary, cooperation with all stakeholders is the only way to succeed. Based on the core of CreativeCoin and combining the security of Proof of Work (PoW), with the energy-efficient set of rules behind Proof of Cooperation (PoC), the core of Pylon Network will integrate the best of both worlds in a fully autonomous and flexible code adopted and designed for the particular needs of the energy sector and the participation of all energy players. Combined with our hardware (energy smart meters, Klenergy METRON), which certifies all energy transactions within Pylon Network, it can offer a transparent and hive-intelligent layer of energy data over the existing (or any future) markets. 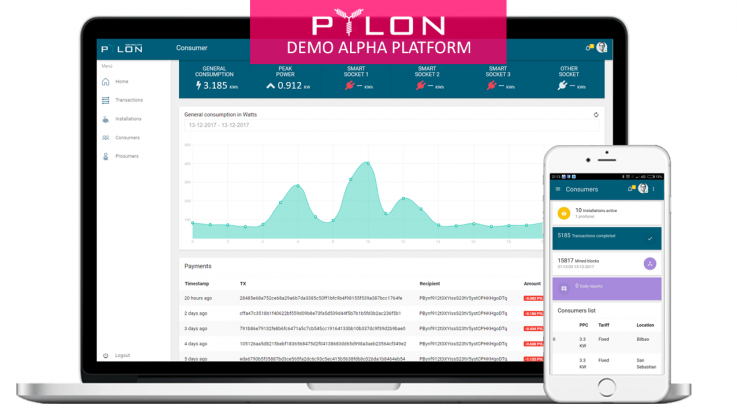 Back in December we offered you a first peek of Pylon Network platform – here ( https://pylon-network.org/pylon-network-platform-first-peek-demo-alpha-version.html). It was basaically a teaser for all the people who were eager to have a look at the prototype version of Pylon Network. – However, the teasing is over! After many months of dedicated, multi-disciplinary and focused work, amplified by the power of collaboration between us and our partners, we are very excited to be in the position of giving access to anyone who want to have a look at the alpha version of Pylon Network visualization page! All you need to do is to register with your email address via our new website, and you will soon after get access to Pylon Network DEMO page. WHAT WILL YOU BE ABLE TO SEE IN THE DEMO PAGE? Energy control panel for the cooperative (or any utility): The demo page offers a first idea of how the energy cooperative will be able to have an overview image of the energy flows between the final consumers at various point in the grid and the renewable energy producers that participate in Pylon Network. Using this as a base, smart energy tools will be integrated, which will allow the energy cooperative (during the demonstration stage, this will be GoiEner) to have a more efficient operation and hence become more a competitive player in the energy market. Transactions certifying the information: All the energy data generated from Consumers and Producers is recorded on the blockchain in the most transparent (and most secure) possible way. The consumption and production graphs allow you to check the recorded energy data from today and yesterday by retrieving the information directly from PylonCoin blockchain. Instantaneous payments of electricity consumption: the consumers pay automatically on a daily basis for their electricity consumption – every 24 hours; they also have the option of paying manually at any point they wish. Since this is a fully flexible code developed for the needs of the energy sector, these variables are free to change in order to adopt to the needs of the cooperative/utility and the specific needs/regulations of any electricity market.By clicking on any hash in the tx column of the payments table you will see the details of the transaction. Prosumers: they will be attributed the characteristics of consumers and producers (both of which are currently available). PylonCoin explorer: will give access to all energy- and payment-transactions within Pylon Network offering revolutionary transparency in the energy sector together with green energy certification through P2P electricity trading. Demand response tool: will provide the energy cooperative with the flexibility of adopting the demand of their consumers if this becomes necessary. This kind of flexibility can be a very valuable tool for the cooperative, since it will be possible to adopt their aggregate electricity demand of all their consumers in periods that electricity is very expensive or is about to exceed the day-ahead load predictions (if exceeded, the cooperative/utility is required to pay a penalty). Demand response will be developed throughout the demonstration stage, in collaboration with GoiEner. SO, ARE YOU READY FOR REACHING OUT TO THE FUTURE? If you are as excited as we are (and you should!) then don’t waste time. Follow the instruction on our updated website (https://pylon-network.org/#demo) for accessing Pylon Network’s demo page. We are always interested to know what you think – what you like and what you think should be improved. So, we would really appreciate if you spend some time to give us your feedback – it can be found on top right of the DEMO home page (purple box). Pylon Network: new website launch (with a surprise!). UK MeetUp confirmed: Pylon Network goes to Oxford!